This facility provides a safe haven for students who have nowhere to go after school. It gives student a place to have fun, while still having the access to educational help if necessary. The Farragut Cornerstone Program was designed to promote social interaction, community engagement, and physical activity with the older generation too. Some of the adult programs include, GED Prep, ESL (English as a Second Language), Parenting Workshops, Special Family Events and also Fitness. This gives not just kids, but the adults of Farragut access to educational benefits right in their own backyard. 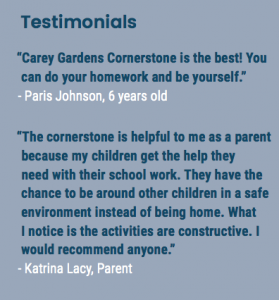 Here is a video provided by the Cornerstone program that explains people’s experiences with The Forgotten Farragut Houses. The Farragut Cornerstone Program has improved kids education and social interactions through many of the activities provided such as basketball and dancing. 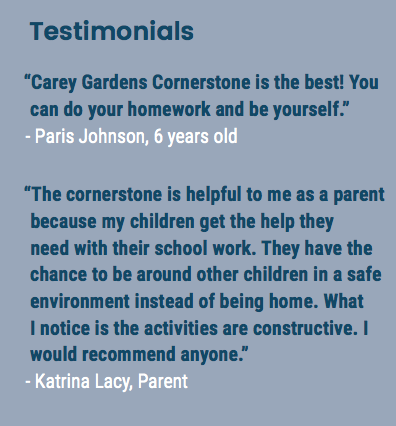 Some of the parents have created testimonials stating that it’s been a good way for their kids to get help with their school work. These improvements should show how just bringing a program like this to the area of Farragut has had a great affect with the people living there. Things such as Community Centers and Afterschool Programs should always be accessible for students in Farragut because it gives them a place to be instead of being at home till their parents come in. It provides access to many programs and if this was taking away from the youth, then who knows what might happen. In areas where crime rates are higher, such as Farragut, It’s good to have an alternative, then to fall in the same pattern due to lack of resources after school. Facilities such as these only improves kids character and learning ability with educational practices and recreational actives that appeals to the younger people that helps them develop themselves into the people of tomorrow! A perfect example of this would be The Salvadori Center program providing kids after school with hands on math and science projects that helps boost creativity. Do educational Programs make a difference? Yes, I do feel like educational programs make a difference, after reading a report called After School Programs in the 21st Century: Their Potential and What It Takes to Achieve It, I believe this paragraph sums it all up. The study conducted by the Harvard Family Research Project also explains more about the academic and social outcomes of some of their studies. In the end, the effect that after school programs have on kids usually Kindergarten through 6th grade, has only been beneficial to not just the student but also their parents who may not be able to help them with certain subjects. To Find out more information, the work cited page brings you to the articles. Thank you!